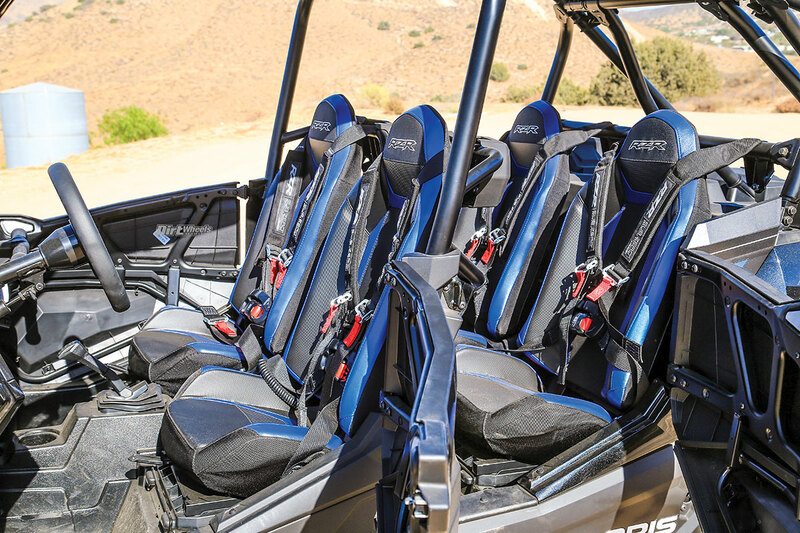 Polaris has a success story going, and it starts with new models arriving first as two-seat versions, and shortly after a four-seat version follows. As you can imagine, as soon as the RZR Turbo S arrived, we had our eyes on the horizon looking for the RZR XP 4 Turbo S to pop into sight. Now that it is here, it did not disappoint. You have a choice of the arrest-me red with black suspension that was on our 2018 two-seat, or a sleek new blue with color-matched suspension arms. The little added color and light in the S front fascia and the tail section add a high-end feel to the look. Four comfortable seats and four-point harnesses for each one are highlights of the 4 Turbo S’ interior. The seat belts make sense in a car this potent. Where the massive, industry-first ITP Coyote 32-inch tires and 15-inch wheels were in your face on the two-seater, on the 4 S they look proper and proportioned. The tires are still right out where you can see them and not cowering under the bodywork. The 72-inch width makes sure of that. And the suspension arms are not merely wider. The fronts are arched for clearance, and the tubing diameter used in their construction is at least double the size of the 64-inch machines. Suspension travel and total clearance have not changed with the longer wheelbase. 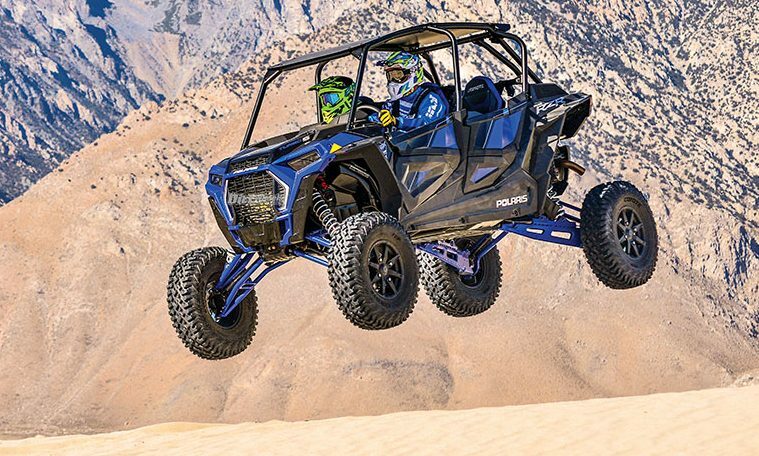 There are still 21 inches of rear-wheel travel and 19 inches in the front, and there is 25 inches of clearance that Polaris calls “usable travel.” It is measured from the skid plate to the bottom of the tires when the suspension is at full extension. Usable travel includes the actual wheel travel, tire compression, and chassis and suspension flex. Polaris is making the statement that you will have frame/skid plate clearance when the suspension is fully bottomed out. These molded rubber parts are new for 2019. They add protection for the rear passengers. Our passengers heartily approved. That Dynamix computerized suspension, the total travel number and the 16 inches of ground clearance do make a difference. We negotiated some huge rocks in a sand wash, and we kissed the frame on a few despite the 32-inch tires and standard ground clearance. Then we started switching the suspension to the firm setting while crawling across the rocks. You can actually feel the car rise up, and you more easily feel it when it drops when you select Comfort or Sport mode. 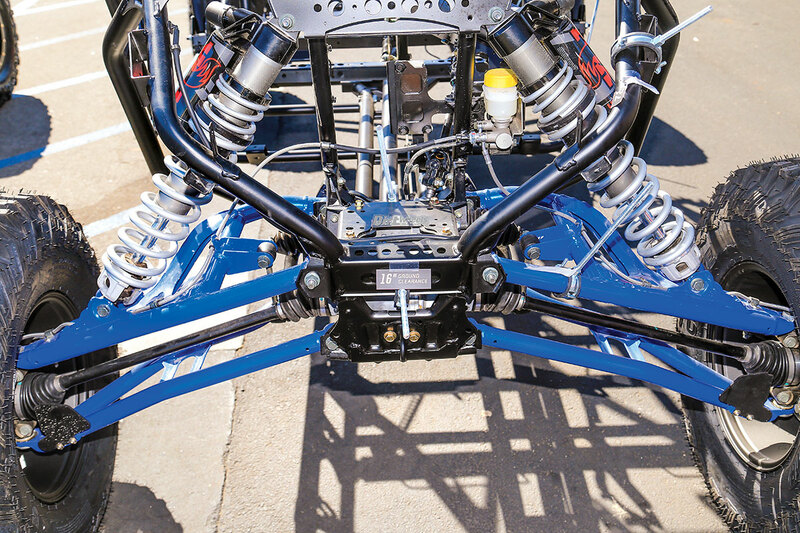 Reinforced arched A-arms, stronger radius rods and beefed-up trailing arms join with the new-to-the-S, Fox, rear 3.0 Internal Bypass Live Valve shocks that are part of Polaris’ Dynamix smart suspension system. While the 4 Turbo S has basically the same suspension as the Turbo S, the four-seater does have heavy-duty, high-clearance lower radius rods in the rear. That fixes the most easily damaged part of the rear suspension. 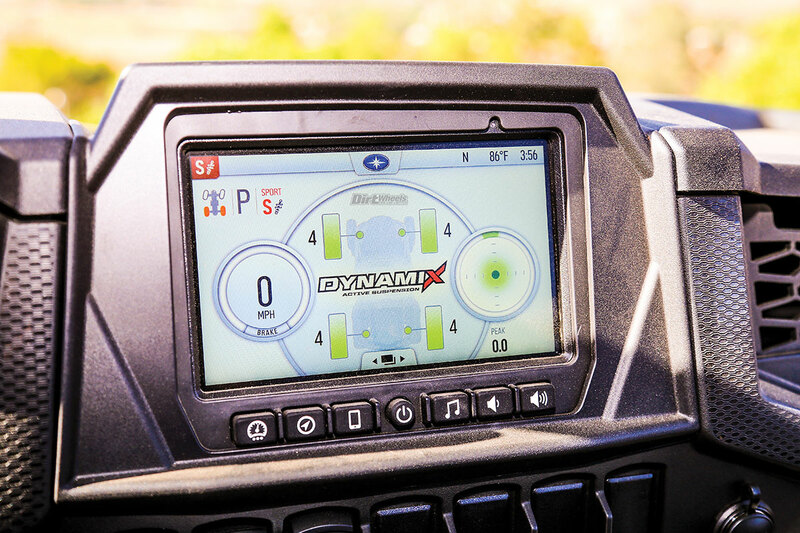 Dynamix machines like the S combine the on-board GPS info and 7-inch touchscreen from the Polaris Ride Command system with the Dynamix computer. It adjusts the suspension on the fly by processing data from the GPS, an accelerometer and a gyro. For 2019, the touch-screen unit is made in-house. As a result, some of the many and varied functions are accessed differently. For instrumentation and in-car features, the XP 4 Turbo S has both the new 7-inch glove-touch center-mount display and an instrument cluster in front of the steering wheel. Among the displays are the Dynamix Visualizer, digital instrumentation, GPS, topographic mapping, Bluetooth and USB smartphone connectivity, AM/FM and weather radio (but you must add speakers and an antenna to utilize the feature), in-vehicle communications capable with optional Sena headsets, speedometer, odometer, trip meter, tachometer, coolant temperature, volt meter, hour meter, service indicator, clock, gear indicator, fuel gauge, hi-temp light, seatbelt reminder light, fault code display, and a DC outlet! It also has a rear-facing camera and is wired for a front camera. There are still three suspension levels selected by a dash-mounted rocker switch. Comfort, Sport and Firm are the settings. Firm maxes out all of the suspension adjustments, and we generally only use it for gaining clearance while moving slowly. In Comfort you are at a base setting, and with Sport you have the same base setting plus 30 percent of added damping force. The computer doesn’t make any adjustments until the car is over 20 mph. Once over 20 mph the computer stiffens the outside shocks when you turn, the rear shocks stiffen when the throttle is wide open and the front shocks stiffen for 1.5 seconds when you brake. Any time all the wheels leave the ground, the suspension goes full stiff. The adjustments are instant and never intrusive. The 7-inch display screen is produced by Polaris now. It was out-sourced before. Screen resolution is much improved. We’ve said that each new Dynamix model further refines the active suspension. 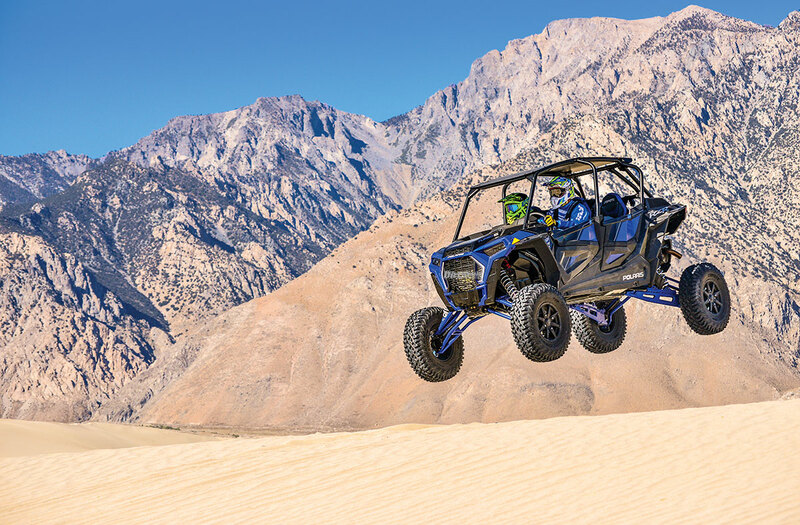 The two-seat RZR XP Turbo S has amazingly effective suspension. If we were forced to complain, we’d say that the long travel has exaggerated dive and squat. As a result, the car feels most settled when you are smooth with throttle inputs; otherwise, the rear squats hard and the steering gets light. With the longer wheelbase of the RZR XP 4 Turbo S, the whole car is calm and less prone to the Trophy Truck squat. It hooks up and accelerates with excellent control. You end up running the car hard. The handling and suspension are so capable that there aren’t many reasons to slow down. Whoops are no trouble, and the longer car is a breeze in the rough. 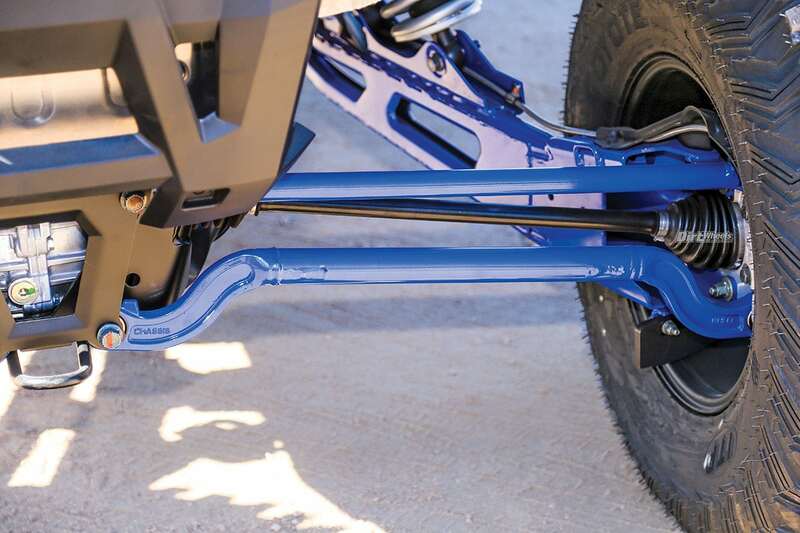 The new, heavy-duty, high-clearance lower rear radius rods are new for 2019. They are a welcome change that fixes a common weak point. For sure the 72-inch width requires some care to keep from banging the sides of the tires into obstacles at the edge of the trail. We headed into some pretty narrow and tight trails we usually run 50-inch cars on. The 50-inch isn’t required, just fun on these trails. We thought the four-seater might feel like a limo, but it really didn’t. Our first outing was in sand and small dunes where the 32-inch eight-ply desert tires were merely decent. We originally thought that our existing 14-inch wheels and sand paddles would interfere with the brakes. You have to trim or remove the plastic wipers mounted on the trailing arms. They are to keep mud from building up inside the rear rims, but that is not an issue in the dunes, so you can use existing 14-inch Polaris wheels on an S. The stock ITP Coyotes hook up well in the desert and provide long tread life on trails with rocks and a firm surface. 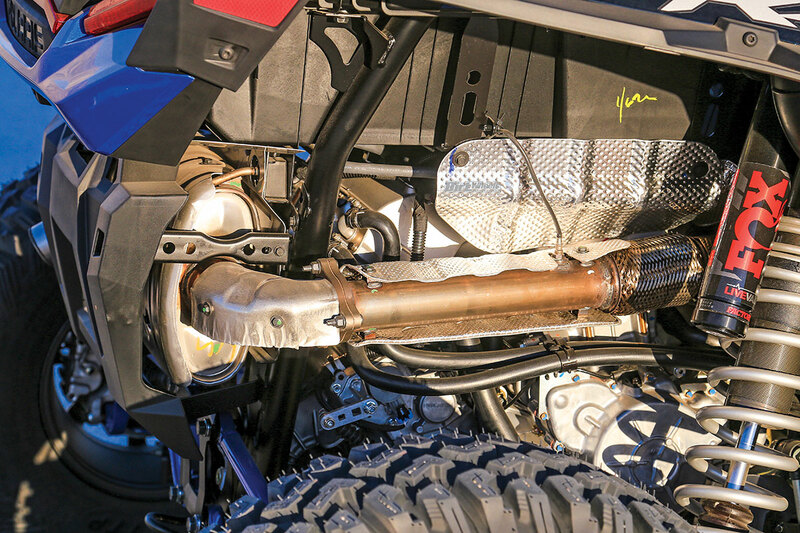 The RZR S exhaust system has all of the latest Polaris updates heat shielding. The system has excellent mounts and strong performance. 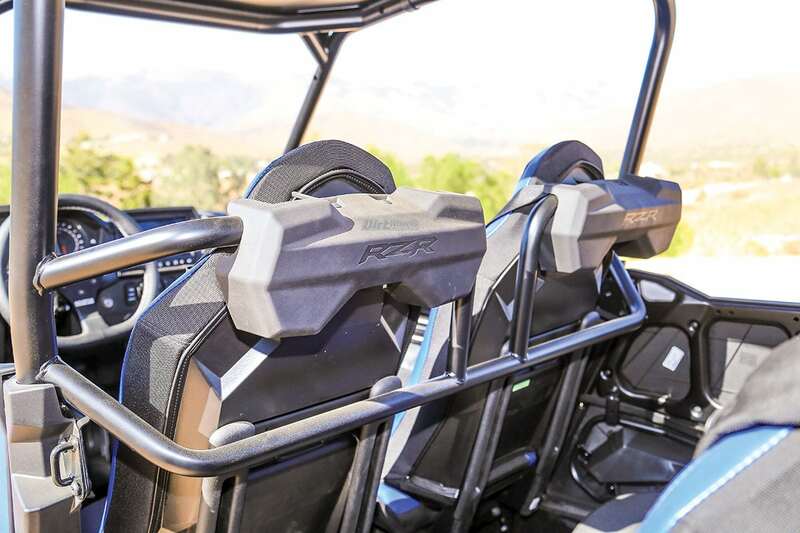 Polaris is currently replacing the roll cage on the RZR S two-seaters and adding further heat shielding. The four-seat S has the latest shielding and additional gussets on the cage. It also has an aluminum roof that makes the structure stronger. Full doors, or more accurately half doors with integrated lower doors added, are standard for 2019. That is a nice touch. Just as the RZR Turbo S paid a price in MSRP and on the scale, the RZR XP 4 Turbo S MSRP is just over $30,000, and the dry weight is only a few pounds less than 2000 pounds! The Turbo S comes stock with actual competition-type four-point harnesses. They are time-consuming to adjust for a new driver or passenger, but the security is essential for a machine this fast. These suspension arms are simply massive compared to those of a 64-inch RZR. You can feel how stout the chassis is as you drive. 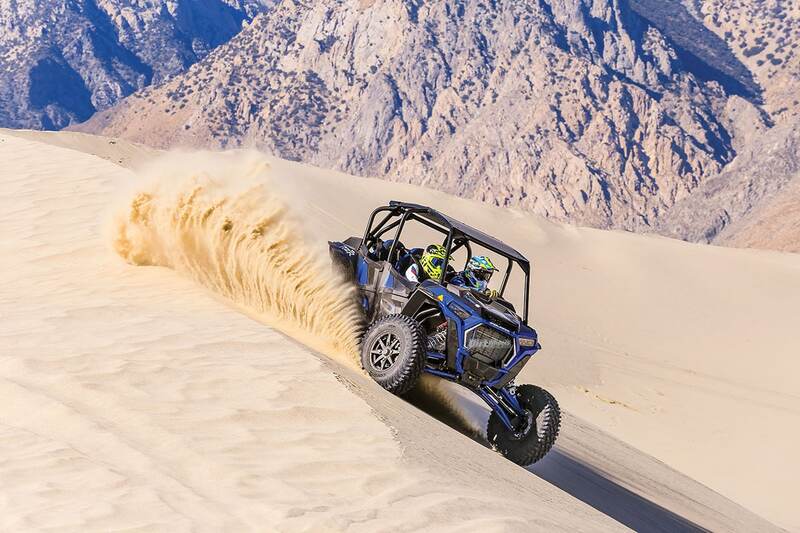 We have been looking forward to this machine from the moment that the RZR S was announced, and we are not disappointed. The whole feel of the car is solid, calm and ready for action. It just loves fast trails and the rough, but, like all RZRs, is just as happy to slow down for tight- and technical-running. The suspension is refined and effective, and the variety of electronic talents this car has is amazing. Dial in your music, track others in your group, mark your trail waypoints and be aware of your need for maintenance. When needed service intervals arrive, you are prompted on the screen. This is the UTV that has everything that a discerning off-roader is looking for. Yes, it is expensive, but we don’t see how you could buy any on the other Polaris suspension packages and use aftermarket parts to equal the S for anywhere near the price difference. If you value performance and great suspension, the retail price is well-spent. 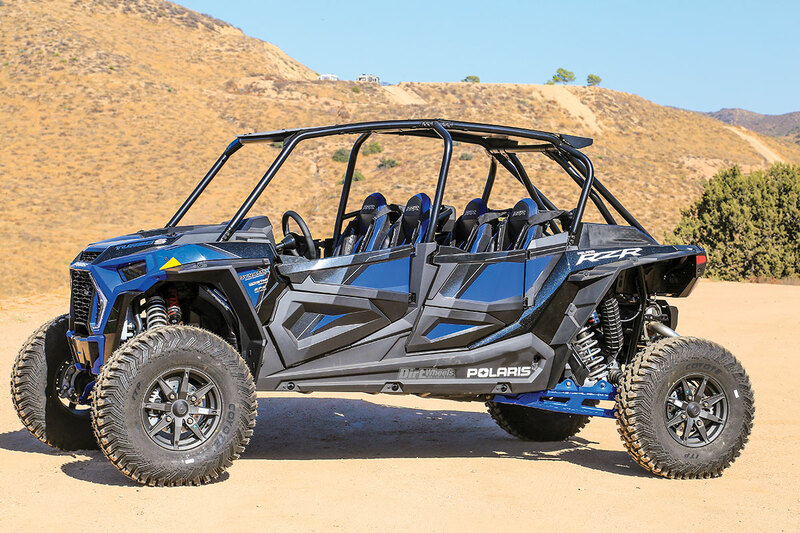 Go to www.polaris.com to learn about their entire lineup! We like the look of the new machine. The lower doors add protection and more color. The front and rear fascia add brightness to the look.